Arsenal, the winner of thirteen national titles and a record of 13 FA Cups is one of the most successful clubs in the history of English football. Livefootballtickets.com makes it possible to visit a match in London with the best Arsenal tickets. Since 2006, Arsenal's new home ground is the fantastic Emirates Stadium, where Arsenal plays in world's most exciting football league: The English Premier League. The Premier League is one of the top leagues in Europe, with 6 teams who all can win the title. Arsenal needs the supports of as many fans possible to play for the title this season. Arsenal has a relatively young team with very talented players. Buy Arsenal tickets and watch these talented players live in the Emirates Stadium. With top players such as Granit Xhaka, Aaron Ramsey, Pierre-Emerick Aubameyang and Mesut Ozil, Arsenal is always a serious contender for the title. In addition to Arsenal tickets for the 2018/2019 Premier League, we also offer tickets for the Champions League, FA Cup and all other matches in England and Europe. Buy your Arsenal tickets here, where all orders are guaranteed! 1st4 Football Tickets sells Arsenal tickets for the Premiership, FA Cup, EFL Cup and Champions League home and away matches. See Arsenal playing at the amazing Emirates Stadium! You can buy your Arsenal football tickets online through our secure online booking system. A group of workers at the Woolwich armaments factory formed the club in 1886. They called their club: Dial Square, which was soon changed in Royal Arsenal. 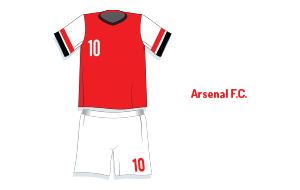 The club turned professional in 1891 and the name was changed to Woolwich Arsenal, which became Arsenal Football Club. The North London Derby between Arsenal and Tottenham Hotspur is one of the most famous derbies in the Premier League. Funny fact is Arsenal started in South London. In 1913 they moved across the city to North London when they entered Highbury Stadium. 1913 was also the year Arsenal got relegated to the 2nd division after nine consecutive seasons on the highest level of football in England. Arsenal promoted back to the First Division when the football league resumed in 1919 after the 1st World War. They haven’t been relegated since. With 97 years they hold the record for unbroken tenure in the top division. Arsenal really started building a legacy in the early 30’s. They won their first 1st FA Cup trophy in 1930 followed by winning the First Division in 1931. In the following years they managed to win another FA Cup and 4 First Division titles. The winning streak ended when football became impossible due to the second World War. Highbury served as Arsenal’s stadium for a period of 93 years. Arsenal moved to their current home Emirates Stadium in 2006. Arsenal’s capacity grew from 38,419 at Highbury to 60,432 at Emirates Stadium. This gives them the opportunity to sell more tickets for every home match. This was really necessary because fans of Arsenal are probably the most loyal fans in the Premier League. A report in 2011 estimated Arsenal’s fanbase at 100 million people worldwide. This makes Arsenal the third most popular team in the world. Arsenal fans are often referred to as Gooners. This name is derived from the team’s name the Gunners. The attendance for Arsenal matches has grown hugely since their move to Emirates Stadium. See this chart with the average attendance at Arsenal’s home matches over the past twenty years. Arsene Wenger is since 1996 Arsenal’s manager. He is the club’s longest-serving manager and most successful in terms of winning trophies. The Frenchman with a modest playing career receives a lot of credits for his contribution in the revolutionising of English football. In the late 90’s he introduced changes in the training and diet of players. Many other Premier League managers followed his footsteps. Arsene Wenger always keeps faith in his own philosophy based on youth development and scouring for talented players all over the world. While his competitors spent millions of Pounds, Wenger gets more satisfaction in discovering young talent. His biggest success was in 2003-2004 when Arsenal managed to win the league without a single defeat. The teams he collected is for many Arsenal fans still the best team they have ever seen. With Jens Lehmann in the goal. Lauren, Sol Cambell, Kolo Toure and Ashley Cole formed the defence. Fredrik Ljunberg, Patrick Vieira, Gilberto and Robert Pires where the midfield players and Dennis Bergkamp formed the attacking duo together with Thierry Henry. This is probably one of the best duo ever in the Premier League. Dennis Bergkamp was involved by 13 goals, while Henry was involved by 39 goals. After 38 Premier League matches their league record stood at 26 wins, 12 draws and 0 losses. Unfortunately for the Gunners and Wenger this was always their last Premier League title up to now. Arsenal only won 3 FA Cups in the past 13 years. This leads to dissatisfaction by the Gooners. The most fans keep buying their Arsenal tickets, but get disappointed one season after another. It’s usually around Christmas Arsene Wenger’s team starts to lose the connection with the top of the table. Wenger is not just the longest serving manager for Arsenal, he is also the manager with the highest win percentage. With over 57% percent there is no former Arsenal manager who can top the Frenchman. Despite this percentage, many Arsenal fans believe it’s time for the club to move on. The fact they haven’t won the Premier League since 2004, is for the fans the biggest reason why the club should look for a new manager. The club listened to their fans and replaced Wenger with Unai Emery. Unfortunately, the Gunners haven’t won the Champions League yet. Arsenal was runner-up in the 2005-2006 Champions League final after losing against Fc Barcelona. Many Arsenal fans believes the club will win the Champions League eventually. Despite the fact the Gunners only won three titles since the start of the Premier League in 1992, they are still second on the all-time ranking. This means they are very steady in the years they don’t win the title. Last season was the 20th consecutive time the Gunners finished within the top 4 of the Premier League. This is a very big achievement with at least 6 very competitive teams in the league. Arsenal is also a very steady factor for years in the Champions League. The 2016-2017 season was the 17th consecutive season they are participating in European’s most important club tournament. All 17 seasons they managed to qualify for at least the second round. This is the first time in 18 years that Arsenal is going to play in the Europa League instead of the Champions League. A club with such a history like Arsenal’s has always some important historical players. Players who always kept faithful to the club and players who won prices for their teams. David O’Leary and Thierry Henry are two of those important players in the history of Arsenal. David O’Leary was a centre back a Highbury between 1975 and 1993. With 722 appearances in the first time he holds the record for most competitive matches for Arsenal. Tony Adams comes in second with 669 appearances, George Armstrong third (621), Lee Dixon fourth (619) and Nigel Winterburn fifth (584). Thierry Henry was an important part of The Invincibles in 2003-2004. In his period between 1997 and 2007 and some matches in 2012, he became Arsenal’s top goal scorer with 228 competitive goals for the Gunners. Another Arsenal hero Ian Wright is second with 185 goals, Cliff Bastin third (178), John Radford fourth (149), Jimmy Brain and Ted Drake share a fifth place with 139 goals for Arsenal. Cesc Fabregas was an important player for a while until he moved back to his former club Fc Barcelona. Barca paid almost 30 million GBP which makes the Spaniard the most expensive sold player. Nowadays he plays for Chelsea and is declared one of Arsenal’s enemies on the pitch. Mesut Ozil is the most expensive bought player for the Gunners. The German star player was unhappy at Real Madrid which opened the doors for Arsenal. They paid 38,2 million GBP for Ozil and he showed immediately why they paid this amount. Mesut Ozil is a really important factor in Wenger’s formation. The Gooners weren’t really satisfied with the performances of last season. For the first time in years Arsenal was at the top of the Premier League table at the beginning of January. Unfortunately, the team started choking from the moment they reached the top of the table. Leicester City took over the number 1 position and they didn’t choke. On the final day of the season Arsenal passed by the rivals Tottenham Hotspur which led to a second place. Some new players need to bring Arsenal for the first time in years back to the top of the table at the end of the league. Granit Xhaka, Rob Holding, Lucas Perez and Shkodran Mustafi came to Emirates Stadium in the summer. Arsene Wenger believes his team is able to play for the title with this squad. The new players combined with stars Alexis Sanchez, Mesut Ozil, Alex Iwobi, Laurent Koscielny and Petr Cech should be able to play for the title. In the Champions League group stage Arsenal is in the group with Paris Saint-Germain, Fc Basel and Ludogorets. This group offers all opportunities for the Gunners to reach the second round for the 16th time in a row. Livefootballtickets.com has Arsenal tickets available for all important league. Do you wish to buy tickets for the Champions League, Premier League, FA cup of EFL Cup? Please browse our Arsenal ticket inventory and you will find the tickets you are looking for. We make it very easy for everyone who wants to buy Arsenal tickets. Follow these steps and the tickets are yours! After completing your order, we will forward your order to our reseller. Our resellers will make sure you will receive your Arsenal tickets in time before the match. All our ticket orders are 150% guaranteed. We have a completely secured booking system so all your ticket orders are fully secured. You can always contact us by email of through the chat service on our site for all your questions.